In many ways, it started with a worm. In the mid-1990s Phil Newmark, one of the newest investigators at the Morgridge Institute for Research, began studying the planarian, a type of freshwater flatworm. The planarian had interested Newmark since freshman biology due to its remarkable ability to regenerate its entire body from scratch. Following his own curiosity, as a postdoctoral fellow he began studying the creature – and in the decades since, the planarian has become a model organism used to help researchers better understand stem-cell-based regeneration processes, an important step toward potential therapies to repair or replace damaged human tissue. But to continue to make important new discoveries, Newmark would say you have to start with curiosity. Newmark points to major breakthroughs in biotechnology and incredible developments in the pharmaceutical industry over the past half century — all that came from unexpected places. Research on yeast helped unravel how our own cells proliferate and how those processes go awry in cancer. Nematodes helped us understand the role of cell death in development. Fruit flies helped establish how the basic pattern of an embryo is built. That passion for curiosity-driven research led Newmark to the Morgridge Institute, joined by his team of eight researchers from the University of Illinois at Urbana-Champaign – not to mention planaria (by the thousands) and other organisms, such as parasites like tapeworms and schistosomes. At Morgridge, Newmark carries the honor of the Burnell R. Roberts Chairship in Regenerative Biology, provided generously by the Roberts Foundation and UW-Madison alumnus Burnell R. Roberts (BBA’50, Accounting). Roberts, a sprightly 89-year-old, was born in the small southwestern town of Rewey, Wis., in Iowa County, but cut his teeth in corporate management as the Chairman of the Board and Chief Executive Officer of The Mead Corporation. He also served with distinction on the Wisconsin Alumni Research Foundation Board of Trustees. Over the past 16 years, Roberts has watched the Morgridge Institute grow from an early idea to a thriving biomedical research institute. 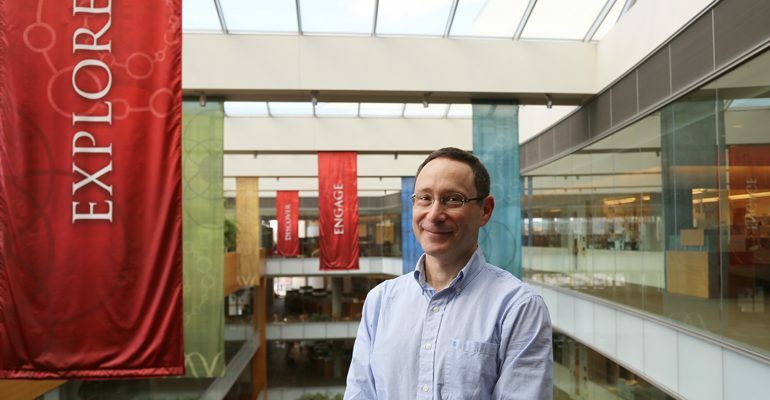 Science, he says, is full of opportunity, but it’s the dedication of researchers that makes science at the Morgridge Institute particularly powerful. “Wisconsin is blessed to have them,” he adds. For Newmark, the chairship is an honor and an outstanding opportunity, especially at a time when many public research institutions struggle to retain key faculty. This is further complicated by the tightening of federal research funds and the risk-averse nature of the funding agencies. Thanks to support generated by the chair’s endowment, Newmark will have valuable new resources to leverage state-of-the-art facilities and continue nurturing the young researchers and scientists in his lab. The funding also opens up new avenues for collaboration, such as with Morgridge Investigator Dave Pagliarini’s work with the Metabolism Initiative and the engineering expertise of the Morgridge Fab Lab. “We have a lot to do,” Newmark says with a smile. Tracy Chong (Ph.D., University of Illinois), HHMI Research Specialist: Tracy is working to develop techniques for producing transgenic flatworms. Jiarong Gao, graduate student: Jiarong is studying a natural product that paralyzes the infectious form of schistosomes and, thus, could prevent infection. She is also characterizing the complement of G-protein coupled receptors in schistosomes to identify the receptor through which this compound may act. Melanie Issigonis (Ph.D., Johns Hopkins), Assistant Scientist (previously a Postdoctoral Fellow of the Damon Runyon Cancer Research Foundation). One interesting aspect of planarian biology is that they can regenerate their germ cells from somatic cells (this does not happen in most organisms); Melanie is trying to understand how this process works. Umair Khan, graduate student: Umair is identifying genes required for proper female germ cell development in planarians. We expect that many of these genes will also be required for proper egg production in parasitic flatworms. Jayhun Lee (Ph.D., Cornell), postdoctoral fellow: Jay is studying the developmental transition that occurs when schistosomes infect their mammalian host. During this process, the schistosome goes from a free-swimming life cycle stage, to a parasitic form that lives in the mammalian bloodstream, and it completely rebuilds its outer surface and alters its morphology. Tania Rozario (Ph.D., University of Virginia), postdoctoral fellow: Tania is studying tapeworms, the parasitic cousins of planarians, to understand how their stem cells drive their amazing regenerative abilities and prolific reproduction. We hope to learn about how the tapeworm stem cells are similar to (and different from) those of planarians and schistosomes (the other parasitic flatworm we’re studying). Rosa Mejia-Sanchez, graduate student: Rosa is studying how an evolutionarily conserved, male-specific transcription factor regulates the development of male reproductive organs in the planarian, which is a simultaneous hermaphrodite. Alyshia Scholl, HHMI Research Technician: Alyshia is working with Melanie to help characterize genes required for proper germ cell development in planarians and also keeps the lab running smoothly.